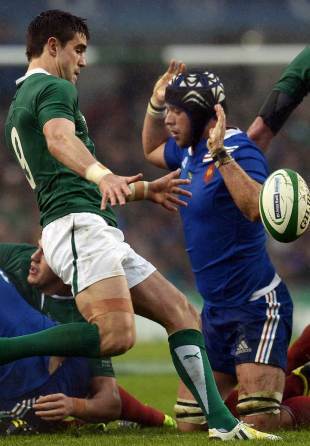 Ireland and France played out a 13-13 draw in their Six Nations clash at the Aviva Stadium on Saturday. Man of the Match: Ireland's Conor Murray picked up the official Man of the Match honour and deservedly so having kept his side on the front foot in incredibly difficult conditions with a superb kicking game. The value of his contribution was all the more evident as the hosts lost direction and momentum when he was withdrawn. Key Moment: Should Ireland have been awarded a penalty when France replacement Vincent Debaty bumped Ireland's Keith Earls off the ball as he attempted to race onto a kick through and claim a late try? A successful kick would have seen the game swing back in the hosts' favour but the officials saw nothing wrong although question marks surround referee Steve Walsh's decision to request assistance from the TMO. Hero of the Game: France's Louis Picamoles did more than anyone to snap his side's losing streak with an all-action display that included a crucial second half try and a lung-busting effort to deny Ireland's Keith Earls a score. Villain of the Game: Ireland's Donnacha Ryan can consider himself a very lucky boy to have escaped a yellow card for an ugly trip on France's Louis Picamoles during the first half. Referee Steve Walsh decided a quiet word would suffice but replays suggested otherwise. Talking Point: You can just about understand France coach Philippe Saint-Andre's faith in Frederic Michalak as a playmaker given his undoubted talent but to hand him the kicking duties when he has a place kicker of Morgan Parra in his side is beyond comprehension. Michalak's wayward efforts in the first half may have cost his side a victory and his coach a job. Play of the Game: A determined Ireland set their stall out early with a powerful driving maul that saw them march 30m up field into the heart of French territory and to the delight of the home crowd. A match that was viewed as a must win for both teams to revive their dismal championships produced a draw, even though the Irish led 13-3 at half time having delivered a tactical masterclass in treacherous conditions. It was the second successive draw between the rivals after last year's showdown in Paris finished 17-17. Paddy Jackson responded courageously to his painful debut against Scotland by landing two enormous penalties and converting Jamie Heaslip's 11th-minute try. Jackson's debut at Murrayfield two weeks ago was ruined by a performance from the kicking tee that contributed to the 12-8 defeat - but the 21-year-old impressed today. In similar weather against England four weeks ago the Irish tactics were ill-judged, but they played with far greater intelligence in their penultimate match of the championship. The final quarter witnessed a reversal of fortunes, however, and they paid the price for failing to capitalise on a dominant spell shortly after half-time. Once again they will wondering how they allowed victory to slip from their grasp. As the match neared its conclusion, winless France began to kick with greater accuracy, used the driving maul and were given impetus by their substitutions and could have triumphed in the final moments. The conditions in Dublin were dire, rain and swirling wind compelling both teams to kick any possession at the first available opportunity. Wing Maxime Medard almost reached a clever chip from Florian Fritz after Keith Earls had dropped a high ball, before Ireland launched a 30-metre maul from a line-out that burrowed a hole through the French defence. Provided with quick ball from the maul, Brian O'Driscoll fired a kick across the ground for Earls to chase until it was bundled into touch by full-back Yoann Huget. The 10-metre line-out was the platform to pierce the French pack with another maul and this time the momentum carried them over the line with captain Jamie Heaslip touching down. Critically given his difficulty from the kicking tee against Scotland, Jackson - announced as 'Paddy O'Brien' on the tannoy - landed a tricky conversion to settle his nerves, shortly before Michalak missed a routine penalty. Heaslip was prominent amid a fired-up Irish pack, throwing himself at opposition forwards with little regard for his own welfare. A collapsed scrum gave Michalak a shot at goal and the Toulon half-back was accurate on this occasion, but Ireland restored their seven-point lead with a monster penalty by Jackson. Jackson had missed a simpler kick shortly before and failing with this far more challenging attempt had the potential to damage his confidence, but the ball dropped the right side of the crossbar. A near-identical penalty followed from the 21-year-old moments later and not to be outdone by his Ulster colleague, centre Luke Marshall produced a mammoth touchfinder. France's suffering was not confined to the scoreboard as they frequently turned the ball over with a succession of knock-ons caused by the treacherous conditions. But they staged a revival shortly before half-time, only for Michalak to prove wayward once more. With the wind behind him, Jackson attempted an even more formidable penalty but this time he lacked the distance. Thierry Dusautoir and Louis Picamoles led France's resistance, but their performances were not being matched by their team-mates and there was little evidence of the fire that threatened England in the first 50 minutes at Twickenham a fortnight ago. Scrum-half Conor Murray raced into a gap from a free-kick, but what followed was Ireland's worst passage of play as over complication undermined a promising attack. Morgan Parra took over the kicking and he made no mistake with his first attempt, but pulled a second wide. Both sides repeatedly dropped the ball, and Ireland no longer performed with the certainty that marked their game in the first half. France wasted a three on one overlap as Ireland's defence began to splinter before a strong final quarter from the visitors. A key turnover was won five metres from their own whitewash, but their problems deepened with the loss of centres O'Driscoll and Marshall to injury in the 72nd minute. Disaster struck for Ireland when Picamoles barged over with seven minutes remaining and Michalak landed the challenging conversion to level the score. Picamoles then intervened to deny Earls a possible try as the match headed for a nerve-shredding climax, but the winning score failed to arrive. 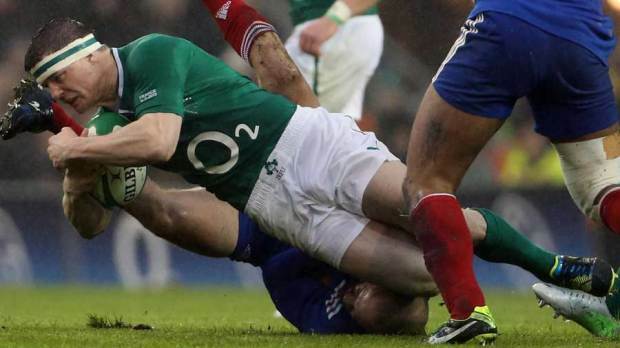 The closing moments were spent worrying over substitute scrum-half Eoin Reddan, who was administered oxygen and then carried off after a tackler fell heavily on his leg.